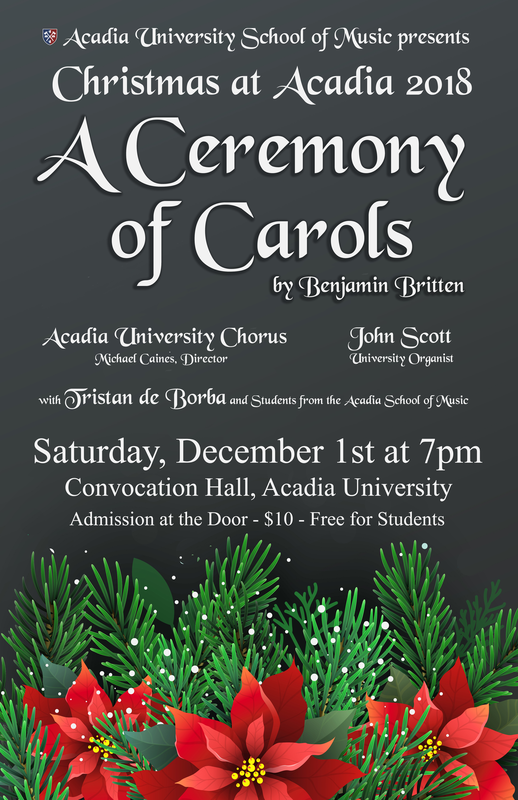 Join us for Christmas at Acadia 2018 with the Acadia Chorus directed by Michael Caines. This season features works familiar sing-along carols, lovely choral arrangements of two carols originating from Ireland and Britain, and a heart-warming original arrangement of O Little Town of Bethlehem. Our featured work is the ever popular Ceremony of Carols by Benjamin Britten. Joining the Chorus will be University Organist John Scott, Tristan de Borba on Saxophone, and student soloists from the School of Music. Come help us bring in the holiday season!